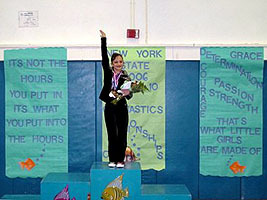 Continuing on her path to a successful career in gymnastics, Dianna Kurowyckyj crossed yet another threshhold on March 11 by achieving first place in the 2006 New York State Level 9 Gymnastics Championships. The win qualifies Dianna for the Region 6 regional championships (New York, Vermont, New Hampshire, Maine, Massachusetts, Connecticut and Rhode Island) which take place in Syracuse, NY on April 1st and 2nd. There she hopes to qualify for the national championships which will take place later that month (April 22nd and 23rd) in Nashville, Tennessee. It will be a tough spring season, but Dianna is up to the challenge. Dianna currently competes for Chelsea Piers where she is coached by Ann Kist.